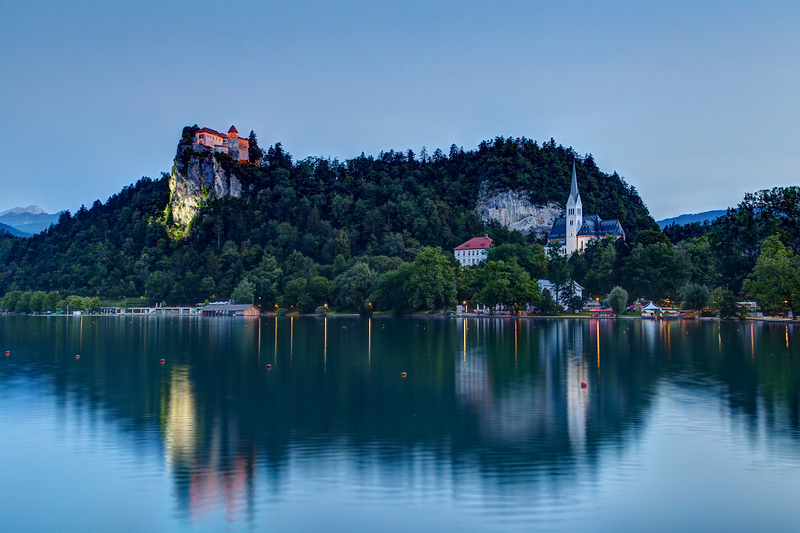 You took the boat ride to Bled’s world-famous island church and admired the view from Bled castle. You ate the kremšnita. And now you’re wondering how to spend a fun evening in the small town on the shore of Lake Bled. Don’t worry, Boris has you covered. 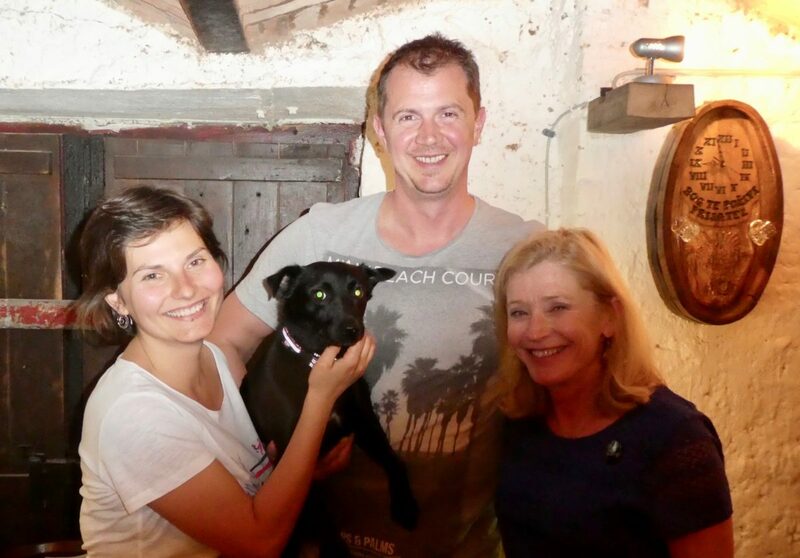 The passionate wine enthusiast and sommelier welcomes you to a 100 year old cellar. 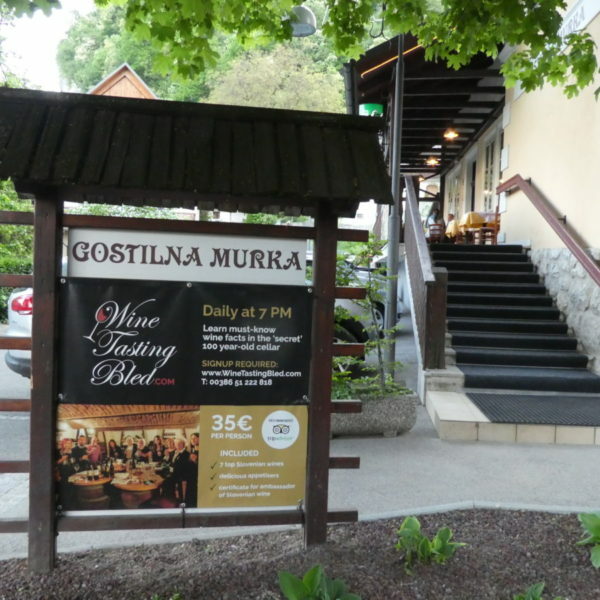 Since 1909, this cozy space beneath a restaurant called Gostilna Murka has been a storehouse for cold beverages, ice, and secrets. Wine Tasting Bled offers 7 unique wines that travelers would be unlikely to find outside Slovenia. In fact, says Boris, more than 80% of the wine produced in Slovenia stays in Slovenia. 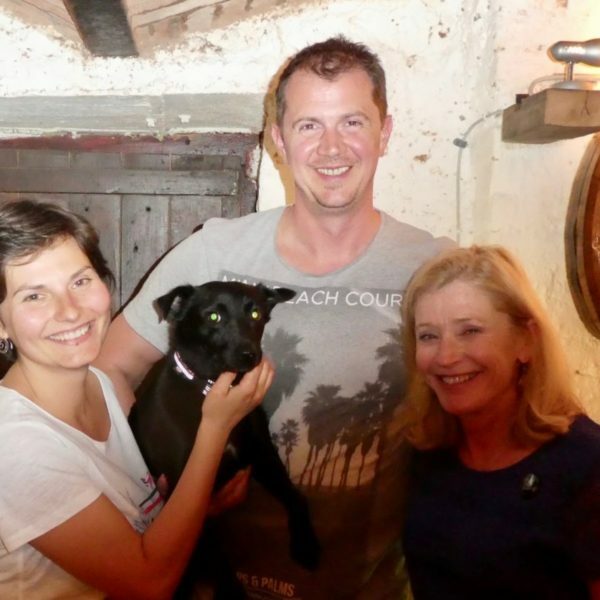 Part of the fun is discovering these vintages with wine lovers from other countries; my companions were Florin, a famed handball player from Romania, and his wife Alina, now working as engineers in Germany. And their dog, Ozzie, who doesn’t drink. We began with a feather-light Ferjančič pinela, a white wine with a floral aroma from the Vipava Valley. Boris explains that the delicate, fresh taste comes from a steel tank. It is not aged in oak and is meant to be enjoyed within one year. He also points out that Slovenia’s wine regions are similar in latitude to California’s Napa Valley and France’s Bordeaux region. 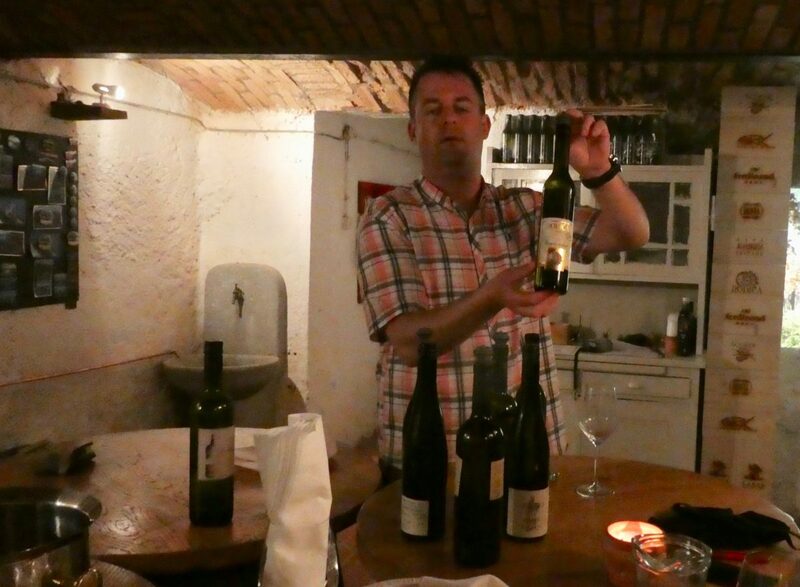 Slovenian winemakers also have been influenced by neighboring Italy and Austria. Our second white wine: a Joannes Protner Renski Reisling aged in oak barrels. Its name comes from a medieval priest of the region who was killed for not divulging the confessional secrets of an unfaithful queen. Slovenia’s second city, Maribor, in the Stajerska or Styrian region, has a rich wine tradition including the world’s oldest grapevine. 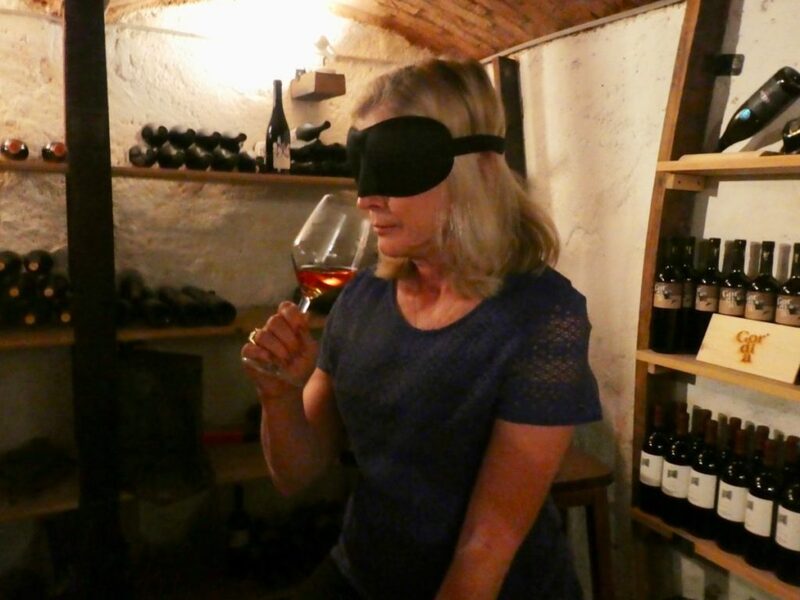 The next taste required blindfolds. We tried to guess if the wine was red or white. No spoilers here. I’ll just tell you that the Gordia Bela Maceracija is the result of white grapes left in contact with their skins, and aged in oak for 18 months. Could this mix of malvazija, sauvignon and grey pinot be one of Slovenia’s famed orange wines? I’ll never tell. It’s a hearty wine that pairs well with rich, dark chocolate. 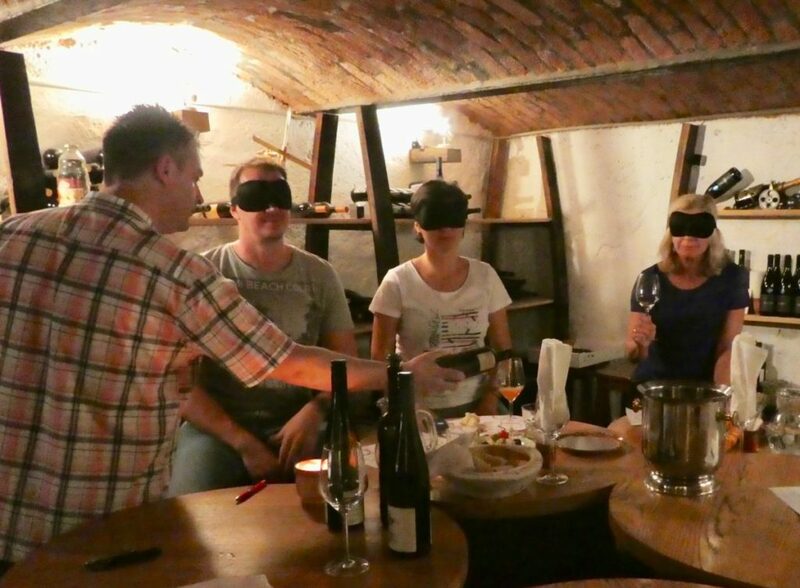 Discovering a unique Slovenian wine while blindfolded. The secret is safe with me. Slovenia’s Dolenska region (bordering Croatia) is credited with the mix of red and white, low-alcohol wine known as cviček. I had experienced this humble blend among my distant relatives, who proudly shared their homemade cviček. In fact, one in 70 Slovenians has a vineyard and makes wine. But in the hands of a talented winemaker, cviček can be something special, paired with Kranjska Klobasa sausage. 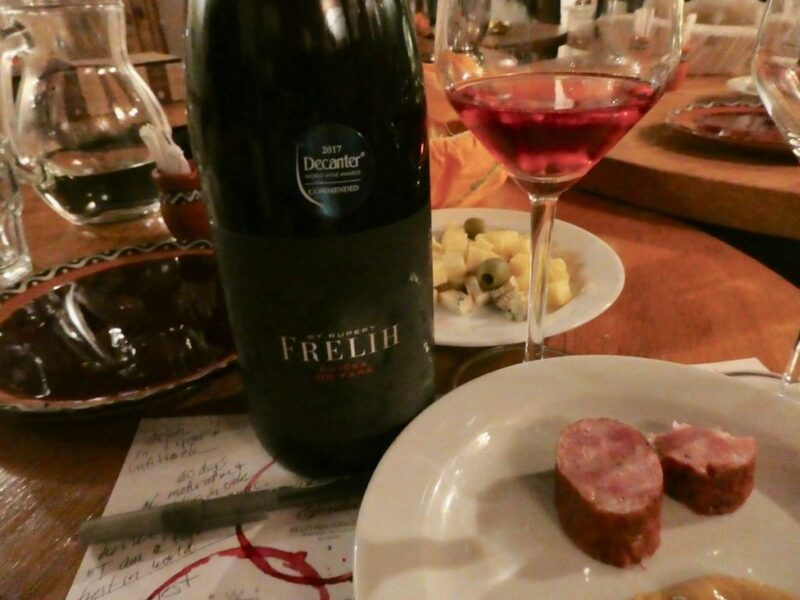 We drank Frelih Cviček. This light, lively drink is meant to be consumed shortly after its production. 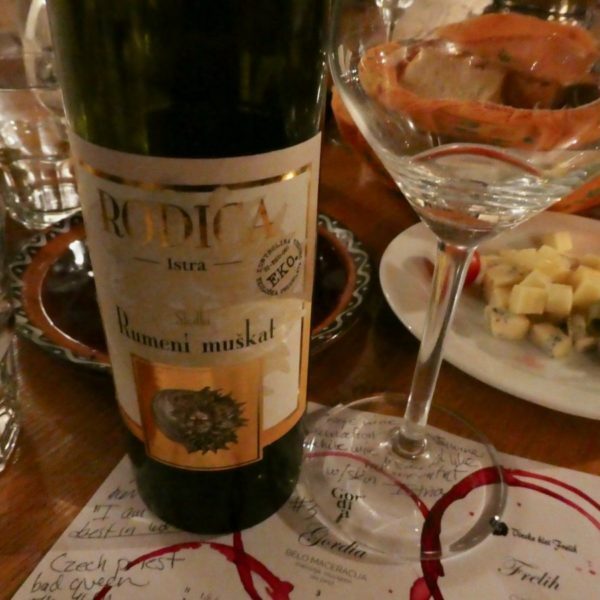 Cviček, a humble peasant blend of red and white, becomes something special in Slovenia. Modra Frankinja has been called the pinot noir of Eastern Europe. We drank an oak-aged vintage produced in Bela Krajina by Suklje. 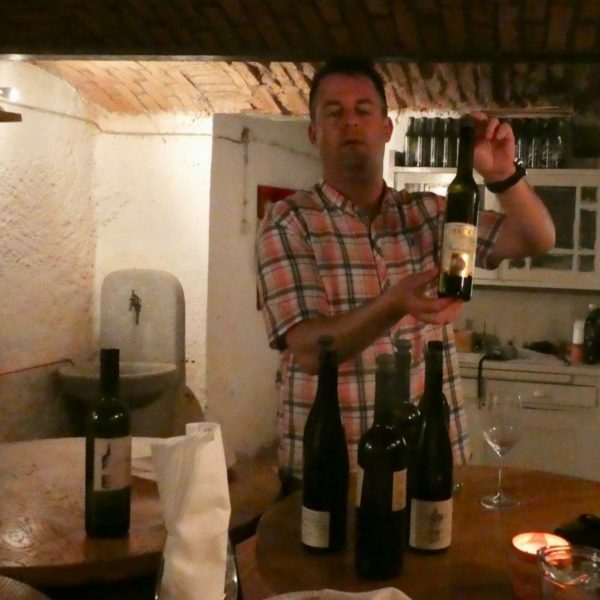 The winemakers also run a popular tasting room in Ljubljana, featured in my post on an epic wine crawl through the capital city. 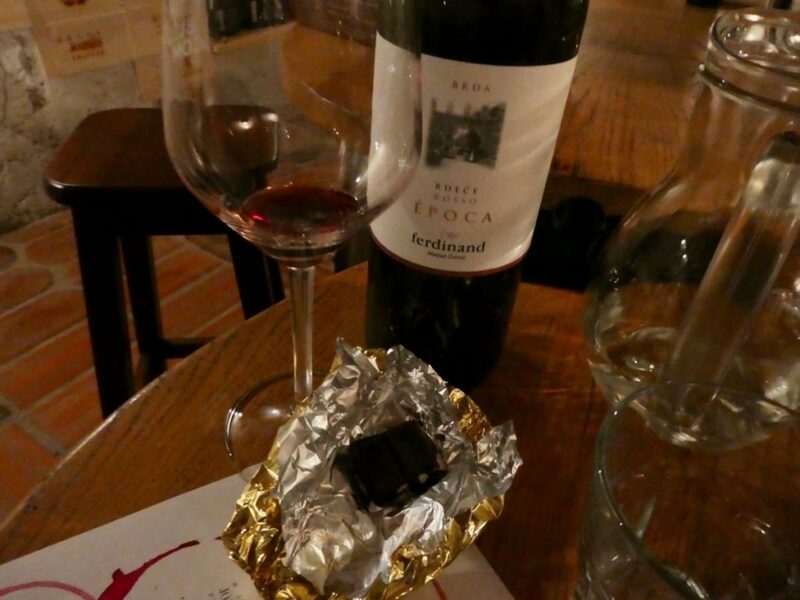 An epic red wine paired well with artisan chocolate. By this time, the red wine enthusiasts in our group were craving something a bit stronger. Boris poured a 2013 Ferdinand Epoca Rdeče, a 14% alcohol mix of aged merlot and cabernet sauvignon. Of course, there are many other Slovenian reds to try, including the Teran and Refošk varieties. 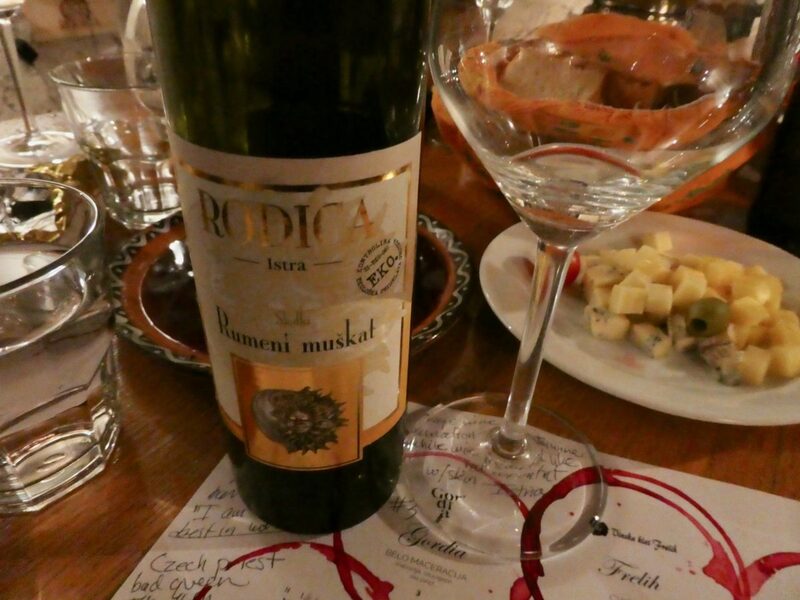 We finished the evening with a dessert wine, Rodica Rumeni Muscat, from the coastal Slovenian Istria region near Koper. 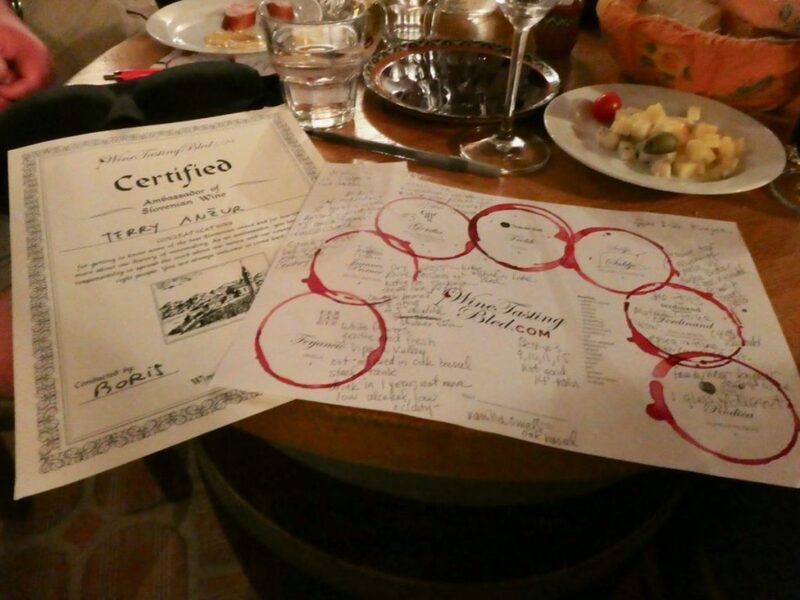 Boris had one more surprise: souvenir certificates for everyone, declaring us to be ambassadors of Slovenian wine. Of course, I couldn’t resist the opportunity to buy a few of my favorite bottles to take along at prices that are quite reasonable for the quality of wine on offer. 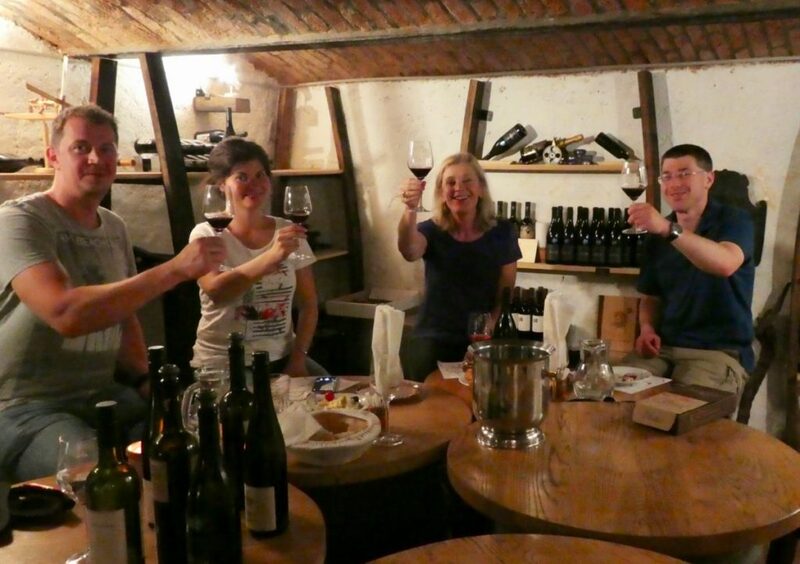 Toasting to new friends and new wine discoveries in a 100-year-old cellar. Signing up: Sign up on the Wine Tasting Bled website. 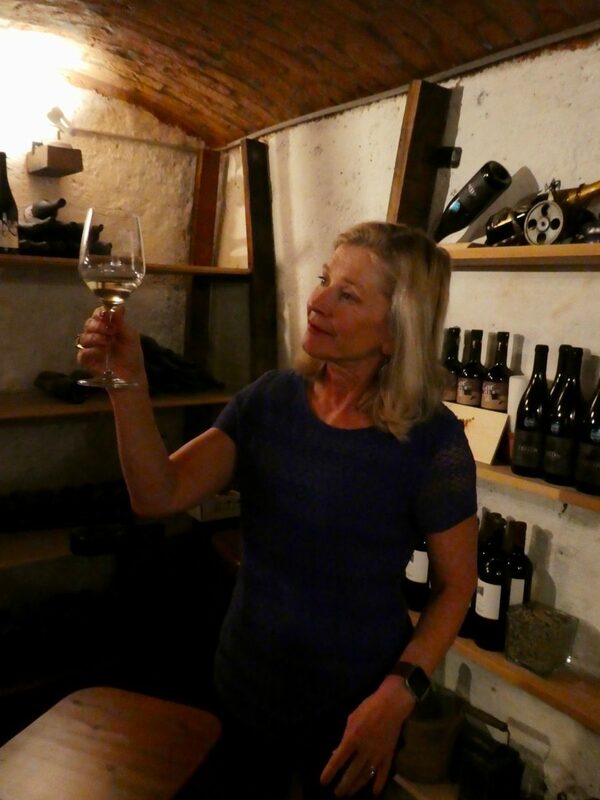 At the time of my visit, the two-hour wine tasting experience was 35 euros per person, an excellent value for 7 generous pours of half a deciliter each. Artisan chocolate is included for a 5-euro upgrade. An ample bread basket and cheese plate are included, as well as a sample of smoky Kranjska Klobasa sausage. There’s another unique Slovenian product, pumpkin seed oil or bučno olje, for dipping. After all the munching and sipping, I didn’t feel the need to have dinner. 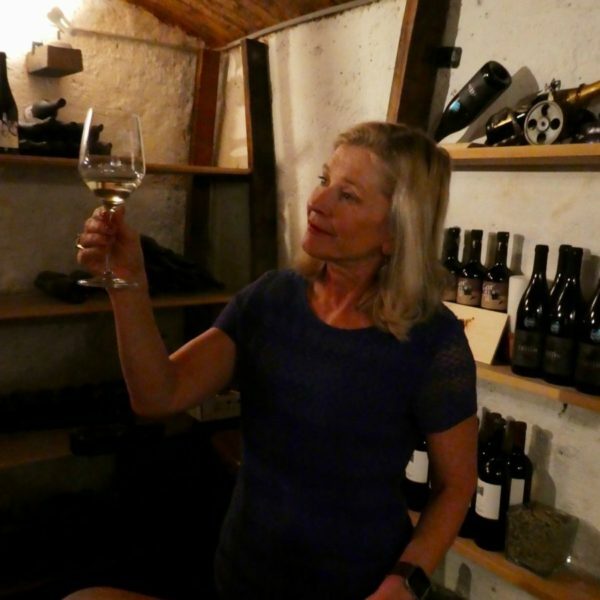 My tasting notes on some wines that were new to me, as a wine lover from California. Getting there: There’s a choice of hotels in Bled, although many visitors come on a day trip. If you are staying in Ljubljana, a bus from the central station reaches Bled in one hour and 40 minutes. The fare is 6.30 euros,. The ride winds through the Ljubljana suburbs and interesting towns like Kranj before traversing into the countryside. Buy your ticket on the bus. The train to Bled is a less desirable choice because the station is outside of town and you will need to get on a bus anyway. If you come earlier in the day you can get in some sightseeing before the wine tasting fun begins. From the bus terminal it’s a 5 minute walk to Gostilna Murka on the road leading to Bled Castle. Bled is only a 45 minute drive away from the capital city of Ljubljana. Save money by reserving your car in advance. If you drive, please designate a driver, who may attend free of charge while sipping soft drinks from the restaurant bar above. Drunk driving is a serious crime in Slovenia. When to go: Tastings are held in English at 7 pm each evening from April until the end of October. The intimate cellar can accommodate groups of 10 to 30 people. 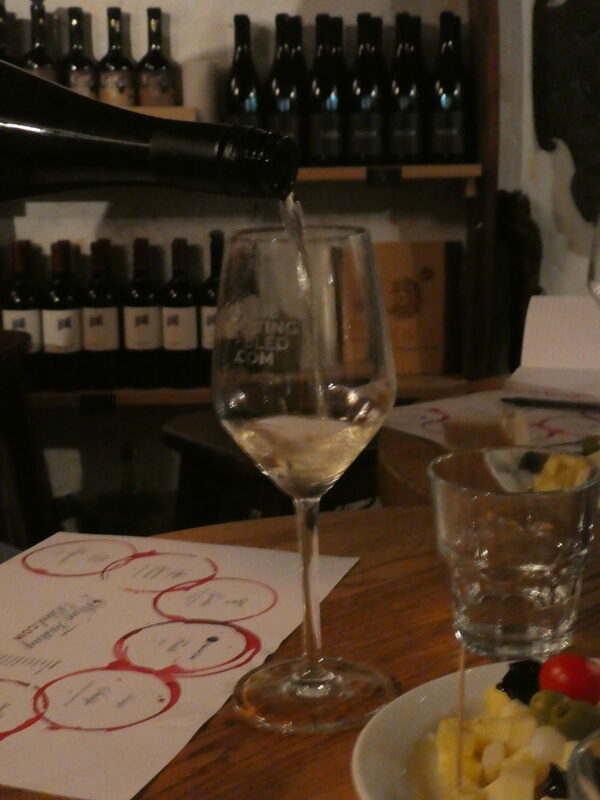 If you’d rather have a similar experience in the capital city, check out my post on Ljubljana’s Secret Wine Cellar. 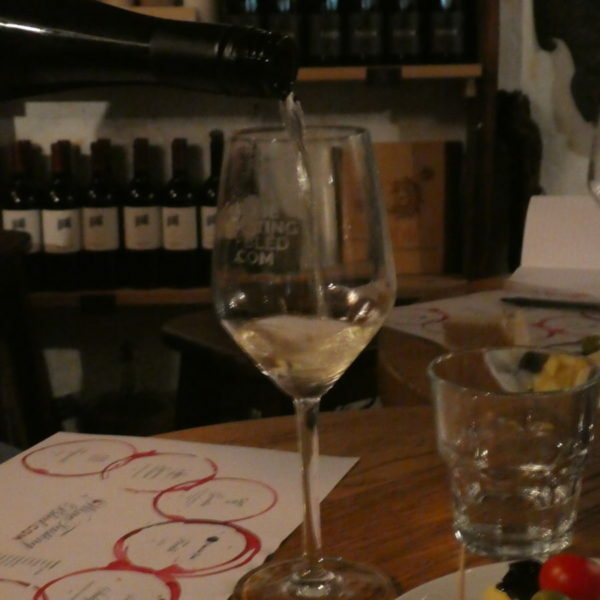 Disclosure: I was a guest of Wine Tasting Bled, which sponsored this post. 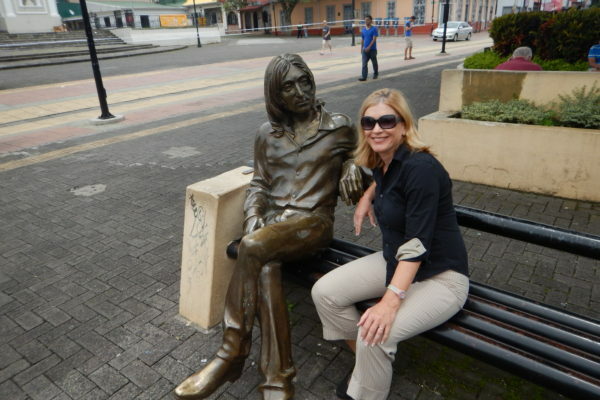 Opinions are my own and reflect the experience and price paid by the typical visitor at the time of my visit. 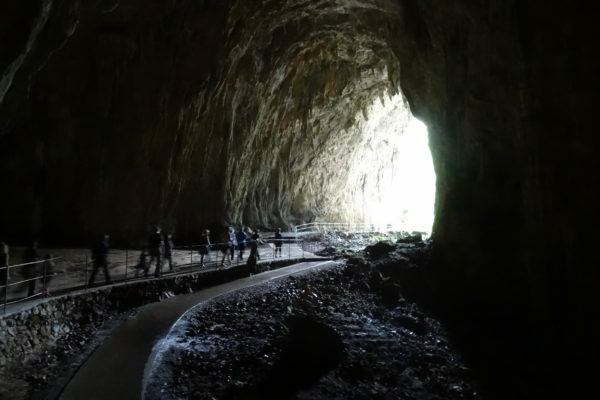 Want more tips for making the most of your time in Slovenia? Like @strangersinthelivingroom on Facebook, and sign up for the occasional email when there is a new post. 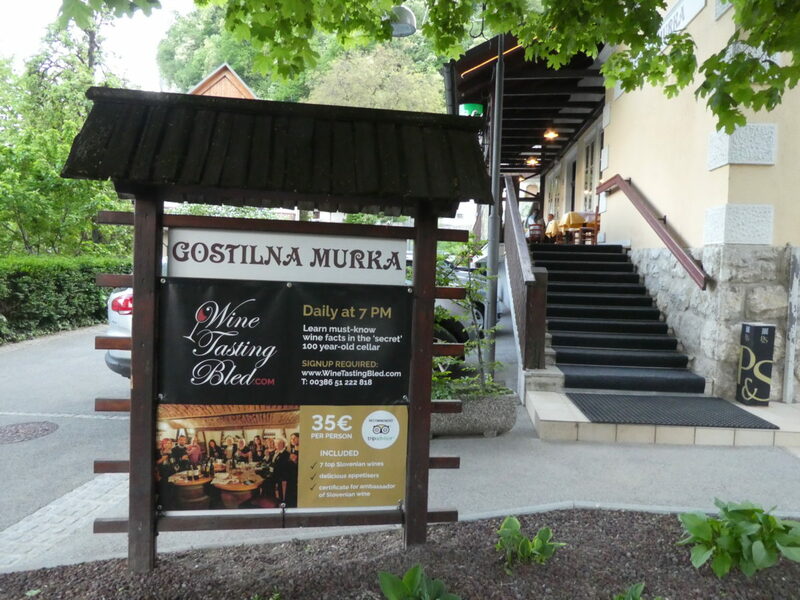 Wine Tasting Bled is located in the town at the foot of the castle on the lakeshore. 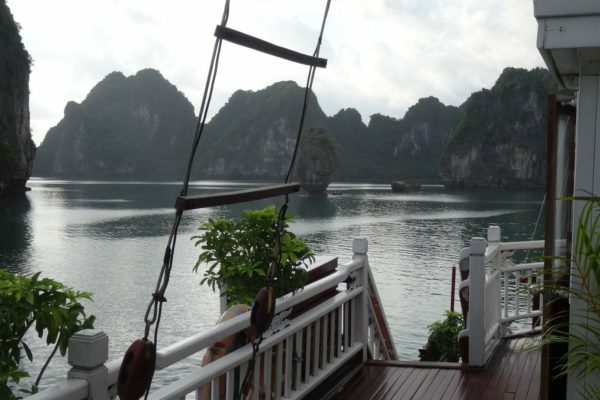 Arrive early for a couple of hours of unforgettable photo opportunities. (Credit Foto Video Coppo di Marco Coppo and www.slovenia.info.